It’s almost time, once again, for the Hobnob Market at the Effingham County Fairgrounds! Block your calendar now because you don’t want to miss this festival-like shopping experience! From vintage to handmade to new spring wardrobe items, plus all kinds of delicious food and drink (wine, teas, you name it), the Spring Hobnob Market has it all! 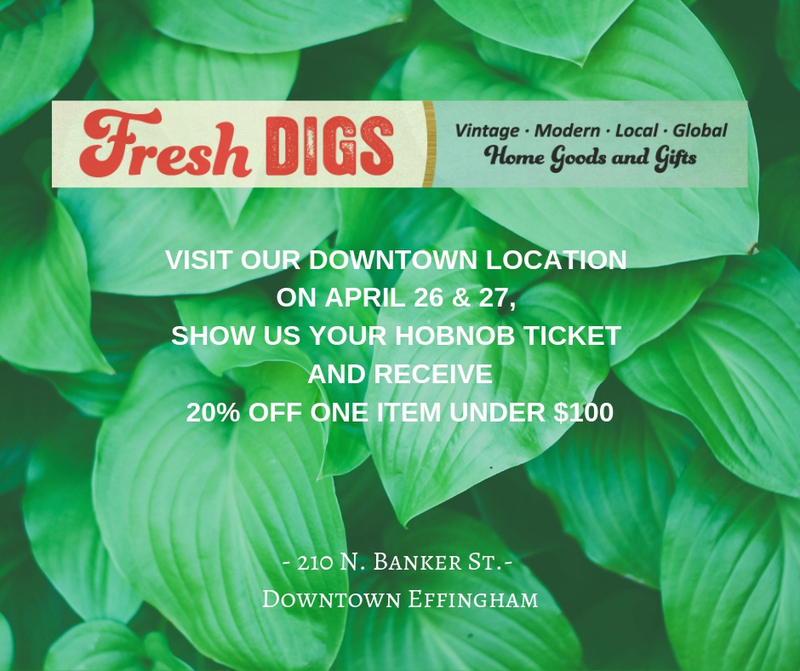 Get your tickets for $10 in advance at Fresh Digs and get entered into two different drawings for Hobnob goodies and cash! Plan to shop Friday from 4 to 9 pm and/or Saturday from 9 am to 4 pm. Fresh Digs will see you at the Effingham County Fairgrounds in the Schutzenfest Building! The brick and mortar location at 210 N. Banker Street will also be open and will be having a sale (see graphic below), as will other participating downtown businesses. Follow the Experience Downtown Effingham Facebook page for details. Note also that on the Saturday of Hobnob, Fresh Digs is hosting a Beginner Crochet Class from 1-3 pm. At 9:30 and 11:00 am join us for Worm Composting Classes at Fresh Digs presented by Effingham Recycles. Register at the links!